Fun in Manhattan Beach California - Things to do and places to stay! 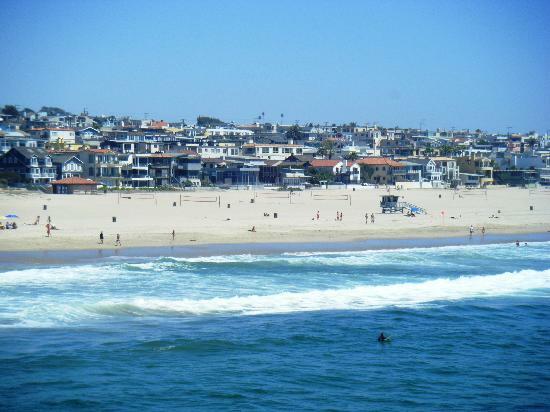 You'll find an eclectic balance of work and play in Manhattan Beach California. After sinking your toes in the soft sand, enjoy an afternoon of shopping, then head on over to one of the many restaurants here to chow down on the finest grub! Manhattan Beach has a scenic 928 foot long pier at the end of Manhattan Beach Blvd. Fishing is permitted here all year. It's fun to take a stroll down the pier and look back at the land or just hang out and watch the paddle-boarders and surfers. The pier provides a nice view and a romantic sunset stroll. Or click on each Hotel to go directly to the hotel page where you can read the reviews. The Strand, basically a street, is a great pedestrian/bicycle path that goes right along the sand through town. It is divided into two sections, the lower sidewalk is for bikes and the upper walkway is for walking. You can go from one end of the beach to the other, passing by some pretty affluent homes. It's a nice walk! The Roundhouse Marine Studies Lab and Aquarium is the round building located at the end of the Manhattan Beach pier. It's something to check out while you're there. They teach students and visitors about the oceans, the environment and marine life. It's not the best aquarium in California but it's fun to check it out if you happen to be there. Manhattan Beach Blvd. is where you'll find a bunch of shops, restaurants and eateries and yes, even bars! where even in the afternoon, they are hoppin'. This is a great place for people-watching too as its a pretty busy area. You'll see a lot of people just hanging out down here, having a good time.